For almost the entire 2nd half of my time on the SlimGenics (SG) diet, the counselors put me on a modified version of what they called “Plan 2”. Without going into laborious details about their plans and exactly what was modified, the end result was that I started drinking a lot of smoothies for breakfast using their pudding & shake mixes, along with fruits and veggies. This experience is serving me very well right now with my hybrid diet! On SG, I was supposed to consume a specific amount of fruit and veggie servings each day; no more and no less. Therefore, I would put 1 serving of fruit in each smoothie, and I would sneak in a veggie serving or two by blending in some raw spinach (it looks gross, but you absolutely CANNOT taste it; I promise!). 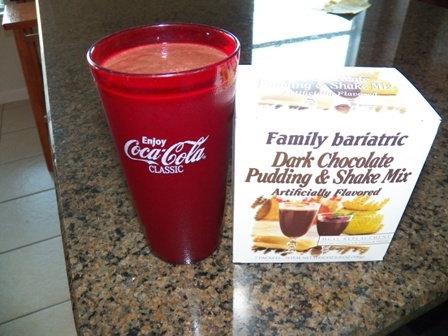 I am still using the SG pudding & shake mixes for the base, as they are only 2 points a packet (I call them SG snacks, but they are NOT specific to them; I buy them online from Family Bariatric and a fellow blogging friend on a diet plan called “Lindora” uses the same snacks with their name on them) and go from there. Dark Chocolate Fruit & Veggie Smoothie – 3 points!